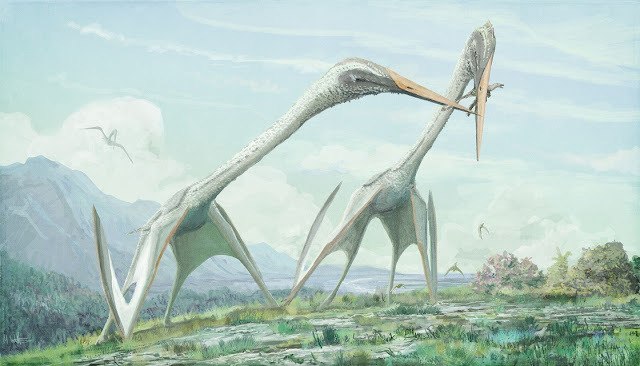 In the last year we've spoken at great length about the giant azhdarchid pterosaurs, those toothless, tube-necked, 10 m wingspan behemoths that awesomed their way into existence at the end of the Cretaceous Period (if you need more of an introduction, check out these posts). Of the three named giant species, we've discussed what is really known of Quetzalcoatlus northropi and outlined why their least famous representative - Arambourgiania philadelphiae - is worthy of greater attention. But we've yet to tackle the most recently named and, in some respects, intriguing giant of them all: the heavily built, giant-headed Romanian behemoth Hatzegopteryx thambema. A quick primer for those of you who aren't familiar with Hatzegopteryx. The first fossils of this Romanian, Maastrichtian pterosaur were announced in 1991 but, on account of their considerable size and robustness, they were interpreted as belonging to a large theropod, not a pterosaur. Eric Buffetaut and colleagues reassessed these bones some years later and made their azhdarchid pterosaur identity apparent (Buffetaut et al. 2002, 2003). As with all giant azhdarchids, only scraps of Hatzegopteryx are known. Bits of skull and a broken humerus from the Densuș Ciula Formation form the holotype, and a large femoral shaft from the same formation may belong to this animal as well. All these elements are remarkable for their size - wingspan estimates of 10-12 m seem sensible (Buffetaut et al. 2003; Witton and Habib 2010) - as well as an unusual degree of internal reinforcement. In addition to thick bone walls (4-6 mm, which doesn't seem much, but is impressive for a pterodactyloid pterosaur), both Haztegopteryx humeral and jaw elements possess large amounts of coarse spongiose bone. This reinforcement may be related to the evolution of some very substantial anatomy. Buffetaut et al. (2003) were able to make a compelling case for a 50 cm wide jaw for this animal, and even conservative extrapolation of that figure suggests Hatzegopteryx was among the longest-jawed non-marine tetrapods to have ever lived (Witton 2013). Such an unusual pterosaur seems fitting for its provenance, the Densuș Ciula Formation representing part of the ancient and peculiar 'Hateg Island' ecosystem. This setting will be familiar to many as an ancient, large Cretaceous island well-separated from the rest of Europe by deep seas, and populated by archaic, sometimes dwarfed or otherwise peculiar dinosaur lineages (e.g. Benton et al. 2010). Since Hatzegopteryx was named in 2002 several Romanian sites of equal age and palaeoenvironmental setting have provided new fossils of giant pterosaurs. Some of them have a real Hatzegopteryx flavour (Vremir 2010; Vremir et al. 2013) and, although a complete specimen remains far from realised, a crude picture of this giant pterosaur is slowly being put together. These specimens are being worked on by different teams and, hopefully soon, we'll have a lot of new Haztegopteryx (or at least large azhdarchid) material to play with. But that's not to say there's nothing new about Hatzegopteryx to discuss here. In fact, today Darren Naish and I published a new, open-access peer-reviewed form-function assessment of a Hatzegopteryx vertebra which takes us a step closer to understanding this enigmatic animal (Naish and Witton 2017). Long-term readers of this blog or Tetrapod Zoology will know that Darren and I team up semi-regularly to write about azhdarchid palaeobiology and may have played a role in shaping modern interpretations of these pterosaurs (Witton and Naish 2008, 2013). Our work this time focuses on a remarkable pterosaur bone known as EME 315, a giant azhdarchid cervical briefly described by Vremir (2010) and likely representing the first described axial element of Hatzegopteryx*. Our ideas about the proportions, structural properties and surrounding musculature of this bone are quite different to what has previously been said about Hatzegopteryx and other azhdarchids and, if we were sensible people, we would have kept quiet until today. However, our enthusiasm for the project and as well as a long, complex writing process has made for a particularly leaky embargo (artwork of our new interpretation of Hatzegopteryx made it into my art book, Recreating an Age of Reptiles, of instance) and many readers may be aware of our punchline: Hatzegopteryx may have a been a particularly powerful and 'short necked' azhdarchid, and maybe even a dominant predator of the topsy-turvy island ecosystem of ancient Hațeg. With the cat already somewhat out of the bag, let's take a look at our substantiation for what is a bold, counter-intuitive claim: could a pterosaur, even a giant azhdarchid, have been a formidable arch predator? *EME 315 is from the Sebeș Formation, and thus not from the same formation as the H. thambema type, and does not overlap with our existing thambema inventory. However, it has the same characteristically thick bone walls, spongiose internal texture and stupendous size that we can recognise in the Hatzegopteryx type specimen. This, and its extremely close geographic and chronostratigraphic (Maastrichtian) occurrence, make referral to Hatzegopteryx reasonable, although we hedge our bets a little in not referring it to H. thambema itself. We settled on H. sp. Mighty EME 315 as presented in our paper. The scale bar represents 100 mm - for a pterosaur vertebra, this is a massive bone. 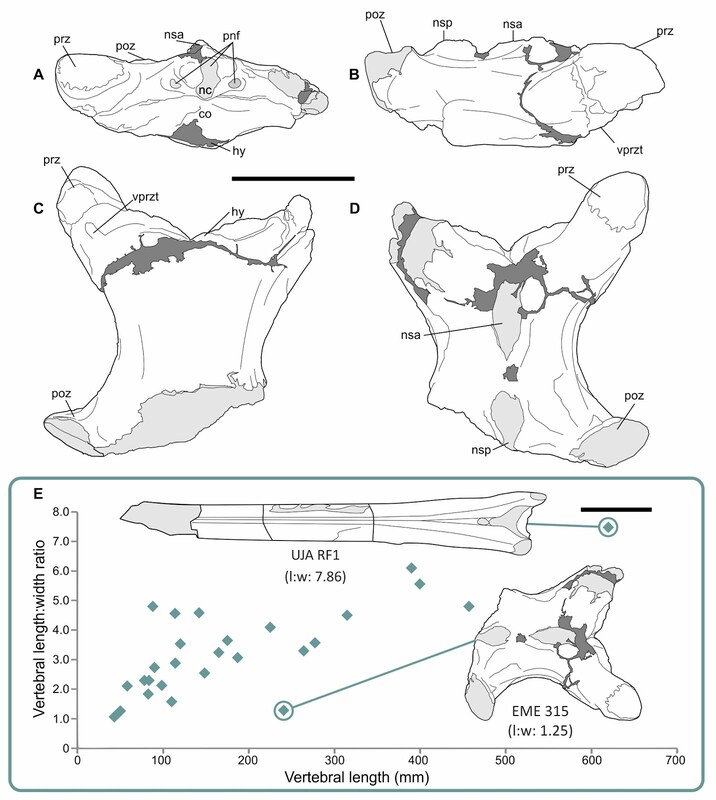 Note the graph at the base of the image - for its size, EME 315 is a clear outlier to other azhdarchid cervical specimens. That's the Arambourgiania type cervical V for contrast. From Naish and Witton (2017). Figuring out the proportions of an animal from one bone is not easy, and is especially challenging for a group with a subpar fossil record like azhdarchids. We were thus quite careful not to push our proportional interpretations of EME 315 too far, but some aspects of the size and basic anatomy of the EME 315 individual can be deduced quite readily. In turn, they provide some insight into the basic shape of Hatzegopteryx. It goes without saying that EME 315 was from an enormous animal. Its width is almost three times that of the next largest known pterosaur vertebra, and that puts it into the 'giant azhdarchid' category without hesitation. We were able to use some fundamental aspects of pterosaur neck construction to conclude that EME 315 might belong to similarly-sized animal as the (estimated) 10-12 m wingspan Hatzegopteryx holotype individual, the same one that has the 50 cm wide skull. That makes sense to me - an animal with a jaw that wide - and who knows how long? - is going to need a chunky set of neck bones to support and operate it. Complete azhdarchid necks are rare, but we were able to track down data for six associated or reconstructed cervical series to plot their scaling regimes and predict the neck length for EME 315. These vertebral series also allowed us to make a predication for where in the neck EME 315 came from - we concluded that it likely represents a seventh cervical, one of the smaller vertebrae from the back of the 'functional' cervical skeleton. Our identification contradicts Vremir (2010), who suggested it was a third cervical, but there are good reasons to doubt this ID. Rehashing our long discussion of the vertebral ID here would be both tedious and unnecessary, especially given that interested readers can head to the paper for our full assessment. It will suffice to say that we're confident a cervical VII identification is much more likely than a cervical III, and this was the assumption we employed for the neck length estimate. Our neck dataset predicted a cervical III-VII length of 1.5 m for EME 315, which sounds impressive, until you realise that the much smaller, 4.6 m wingspan azhdarchid Quetzalcoatlus sp. has a neck of equal size - 1.49 m long (below). By contrast, the giant holotype cervical of Arambourgiania, which probably also represents a gigantic animal of 10 m(ish) wingspan, gives a reconstructed cervical III-VII length of 2.65 m. So EME 315 has a neck no longer than that of a pterosaur with perhaps half its wingspan, and much shorter than that of at least one other giant species. We thus suggest that, for its size, Hatzegopteryx had an abbreviated neck skeleton. Of course, this is not the first time the potential of short-necks in azhdarchids has been raised - it's not even the first time Darren and I have discussed it in a peer-reviewed paper (Vremir et al. 2015). But Naish and Witton (2017) is the first time this hypothesis has been outlined in detail and substantiated with a dataset of neck bone measurements, so it feels that we've elevated the idea to something that can be discussed and challenged more legitimately. Neck lengths in large and giant azhdarchids. 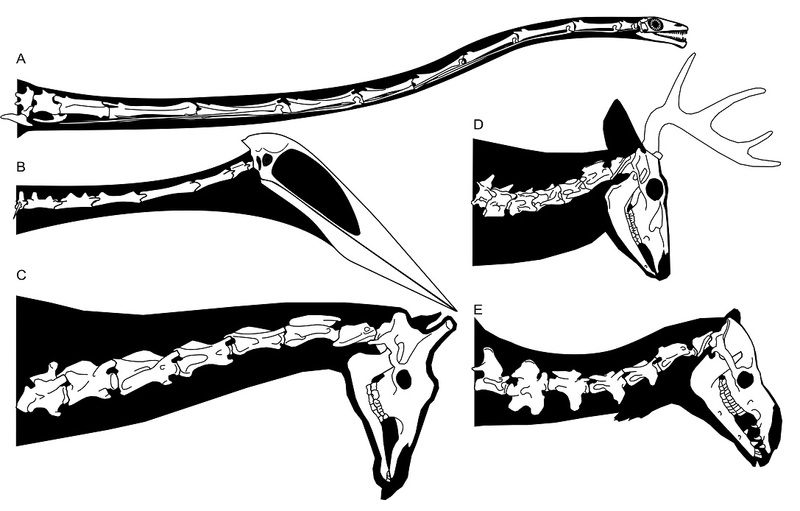 A and B show Hatzegopteryx in lateral and dorsal aspect (B shows EME 315 and the holotype jaw bones only, but gives you an idea how chunky its neck was); C, shows Arambourgiania (known bones in white) with a reconstructed neck (grey elements); D and E, Quetzalcoatlus sp., lateral skeletal and dorsal view of skull and neck. From Naish and Witton (2017). A short-necked azhdarchid may not seem like a big deal, but they're potentially important for at least two reasons. The first is that azhdarchids are in part classified by their super-elongate neck bones, but our data indicates that this may not be a universal trait. We used our neck bone dataset to predict that the longest bone in the EME 315 neck - cervical V - would have only just exceed 400 mm, which makes its length less than twice the width of EME 315. By contrast, a typical azhdarchid cervical V is 5-8 times longer than wide. We need to find a complete Hatzegopteryx neck without hypertrophied mid-series cervicals to confirm our calculations, and have little idea how common this 'short necked' variant might be within Azhdarchidae as a whole (we helped describe another proportionally short Romanian azhdarchid vertebra, R.2395, which could be a second 'short necked' species a few years back - Vremir et al. 2015), but - if verified - a 'short necked' morph could complicate how we characterise Azhdarchidae. Secondly, and perhaps of more general interest, this calculation adds to increasing evidence that azhdarchids may have differed rather dramatically in overall proportions. A number of workers have criticised the concept of azhdarchid anatomical uniformity in recent years (Vremir et al. 2012, 2013, 2015; Witton 2013), and our new paper adds further force to that argument: data for skulls, wing morphologies and now necks hint at a range of bauplans within the group. Their categorisation may not be as simple as 'robust' and 'gracile' forms as I've previously suggested (Witton 2013), but it's increasingly difficult to view Azhdarchidae as a parade of Quetzalcoatlus clones. This is of interest to not only researchers - differing forms might indicate differing behaviours and ecologies - but is something for artists to take note of too. 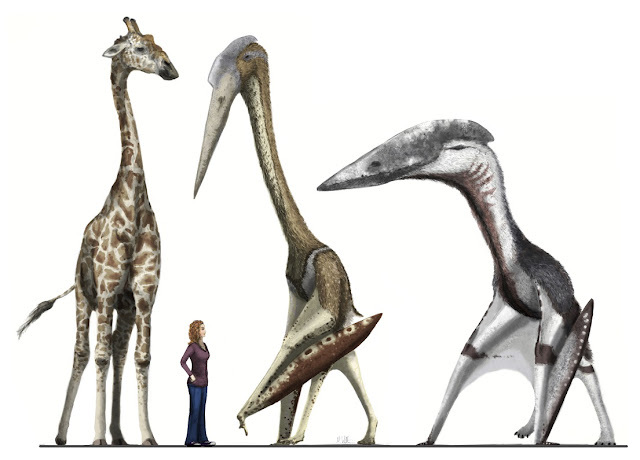 Just how does our new 'short-necked' Hatzegopteryx compare to a regular, long-necked giant form? Something like this. That's our Industry Standard 5.8 m tall male Masai giraffe on the left, the Disacknowledgement centre left, Arambourigania centre right, and Captain SuperChunk on the right. As restored here, Hatzegopteryx is nowhere near as tall as Arambourgiania, but the bulk of its skull and neck likely made it a more formidable animal. Being interested in azhdarchid ecology, we wondered how the different proportions and internal anatomy of giant azhdarchid cervicals might influence their ability to withstand neck stresses caused by foraging, supporting their heads and so on. We performed a range of bending strength assessments on both the robust and thick-walled EME 315 and the elongate, slender-walled tube that is the giant holotype Arambourgiania cervical V. There are too many variants of the experiments to report all the results here (again, see the paper for details), but the TL;DR version is that the performance difference was consistently huge. OK, no-one was expecting the long, gracile Arambourgiania vertebra to outperform EME 315 in a bone strength competition, but the difference between the two is significant enough to indicate very different neck functions. Even comparing Arambourgiania's best bending performance against EME 315's worst, the latter is ten times stronger. We extrapolated our data to assess bending strength in the longest (and therefore weakest) neck bone in the Hatzegopteryx skeleton (a hypothetical cervical V) and it still outperformed its counterpart in Arambourgiania by several biomechanical miles. A larger cross-section, shorter vertebral body and thicker bone walls all contribute to EME 315's stellar bending performance, and we identify several additional aspects of reinforcement and strengthening of EME 315 in our paper. It's therefore clear that the neck structure of Hatzegopteryx was in a different biomechanical league to that of Arambourgiania, and this implies vastly different neck functions in these species. We expect that one factor in this distinction is the wide, presumably heavy head ascribed to Hatzegopteryx, and infer that the weaker neck bones of Arambourgiania would require a narrower, gracile variant of the azhdarchid skull (maybe something a bit Q. sp-like). But the strength of the Hatzegopteryx neck seems high even accounting for its likely skull size, and we postulate that additional loads - big prey items, violent uses of the head and beak during foraging - may have contributed to its boosted structural properties. Supporting this hypothesis are features indicative of large soft-tissue volumes around the neck of Haztegopteryx. Classically, the reduced features of azhdarchid neck vertebrae have seen them regarded - and depicted - with minimised cervical musculature and ligaments. We regard this view as problematic for a number of reasons. The first is that complete azhdarchid necks show that only the mid-series vertebrae lack complex anatomy indicative of muscle and ligament attachment. The complexity of their neck skeleton as a whole is not far off that of a 'normal' tetrapod, where the anterior and posterior vertebrae are relatively complicated to allow for greater volumes and intricacies of soft-tissues in these regions. Yes, azhdarchids do reduce their vertebral complexity further than most species, but not so far that we should assume their in vivo necks were little more than bony tubes covered in skin. Reconstructed cervical series and associated azhdarchid specimens show that their necks were not just made of bony tubes, but variably complicated bones in a pattern structurally typical of other long-necked tetrapods. What might this mean for soft-tissue development? One obvious implication is that at least the anterior and posterior neck regions were likely fleshier than often considered. From Naish and Witton (2017). Furthermore, assuming azhdarchid neck muscles and ligaments were basically homologous to those of living reptiles, some attachment sites must be regarded as expanded, not shrunken. These include particularly deep shoulder blades (for anchoring neck elevators and lateral flexors) and deep basins at the back of the cranium (for anchoring neck-skull extensors). While famously lacking vertebral processes on their mid-series cervicals, a suite of scars along the dorsal surfaces of azhdarchid cervicals betray long muscle or ligament attachments, while the vertebrae at the extremes of the neck have well-developed neural spines. Most startlingly, the expansion of their zygagpophyses take on new significance when we realise that these structures anchor numerous neck muscles in living sauropsids. So yes, azhdarchids certainly lost and reduced some areas of neck muscle attachment, but others were enhanced. The peculiar cervical anatomy of azhdarchids likely reflects an economising, rather than all-round loss, of neck soft-tissues. Bringing this discussion of soft-tissue back to the giants, we have to look at Arambourgiania and Hatzegopteryx as once again reflecting very different types of animals. Our Arambourgiania cervical has much smaller areas for soft-tissue attachment compared to EME 315, which has immense, complicated anatomy in all the areas we associate with cervical soft-tissues in living sauropsids. This may partly be explained by EME 315 and the holotype Arambourgiania cervical being from different parts of the neck, but complete azhdarchid necks suggest these bones provide some general sense of neighbouring cervical skeleton anatomy - it would be weird if the Arambourgiania cervical V was juxtaposed with a massive, EME 315-type bone, for instance. We take this to indicate that EME 315 was not only a strong bone in a robust neck, but that the cervical skeleton of this animal was perhaps wrapped in large, powerful muscles and ligaments - exactly the sort of soft-tissues that can deliver those demands hinted at by our bending strength tests, and would be needed to wield that enormous head. These results get most interesting when we plug them into the bigger picture of giant azhdarchid anatomy and lifestyles, because there seem to be a couple of different stories being hinted at here. For example, we can take the long neck, relatively low cervical bending strength and lessened areas of muscle attachment in Arambourgiania as placing restrictions on prey size as well as precluding violent, dynamic foraging strategies and other behaviours that would impart high stresses on its neck anatomy. 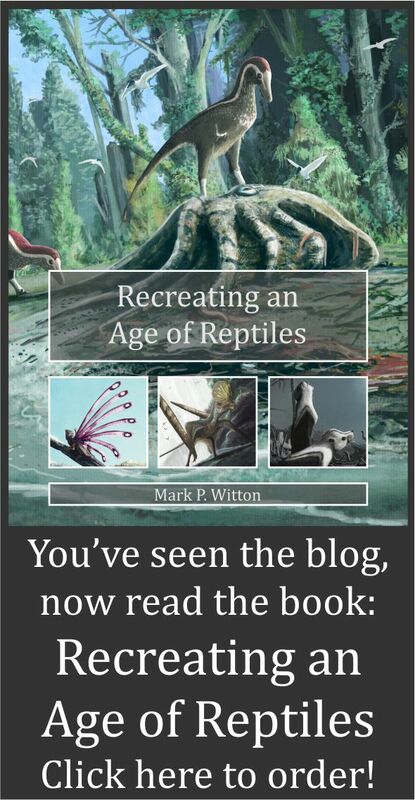 Assuming the 'terrestrial stalker' model for azhdarchid lifestyles (Witton and Naish 2008, 2015) applies to the giants, we might imagine Arambourgiania as preferring smaller prey and relatively lightweight foodstuffs: smallish animals, the eggs of larger reptiles and birds, and generally anything that wouldn't put up too much of a fight. These would still be formidable animals - remember that they stand 4-5 m tall - but all indications are that they represent the 'lightweight' end of the azhdarchid palaeoecology spectrum, and likely behaved accordingly. Giant azhdarchid pterosaurs, diet edition. What we know of Arambourgiania implies they preferred smaller prey, such as diminutive dinosaurs, which may have been caught using relatively undemanding means.From Naish and Witton (2017). The emerging picture is rather different for Hatzegopteryx. Here, we can plug our results of a relatively short, strong neck and high fractions of cervical musculature into its overall robust construction, reinforced bones, massive and wide jaws, and stupendous size. Collectively, this paints an image of a far more solidly built and powerful animal than Arambourgiania. 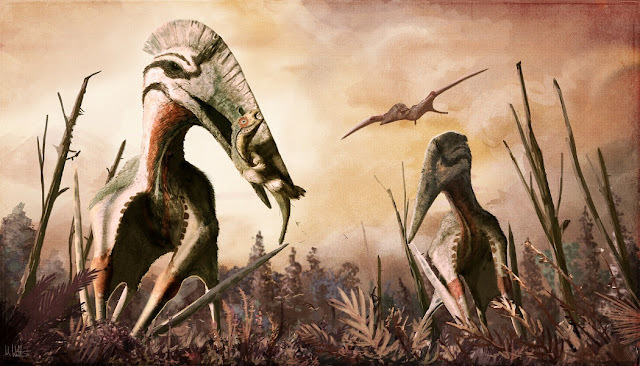 If - as most of us now seem to think - azhdarchids were 'terrestrial stalkers', we can imagine Hatzegopteryx as as a giant azhdarchid turned up to 11: a prairie-roaming giant with elevated maximum prey size and capacity for violent and forceful foraging tactics. Given how dangerous we know modern azhdarchid-like birds can be, and armed with a powerful neck and giant, reinforced skull, we might even imagine Hatzegopteryx using powerful bites, bludgeoning blows of its head and stabbing motions to tackle prey too large to swallow whole. If we're right, Hatzegopteryx was both a truly awesome, but also entirely terrifying animal. There is not exact modern analogue for this sort of creature, but if you imagine a giant mix of a shoebill stork, a ground hornbill, and the Terminator you might be pretty close. The Hatzapocalypse: a group of foraging Hatzegopteryx find a chunky, subadult rhabdodontid Zalmoxes. Rather than pursuing baby sauropods or raiding nests, our interpretation of Hatzegopteryx implies it was a dangerous predator of mid-sized or larger animals. Whether it used the catchphrase "Hatze la vista, baby" after each successful hunt remains a matter of debate among scientists. From Naish and Witton (2017). It is significant to this hypothesis that no large theropods are known from the same sediments as Hatzegopteryx. We can never say never with negative evidence, but the Maastrichtian sediments of Romania have been sampled for centuries and not a single large predatory dinosaur bone has been found - not even a single tooth. These are the only sediments in the world where you stand a better chance of finding a giant pterosaur than a large theropod, and it's hard not to look at that as intriguing. Hatzegopteryx is the only carnivorous animal we know of from this time and place which was large enough, and robust enough, to tackle good-sized prey, and we postulate that it may have taken the 'arch predator' niche occupied by theropods elsewhere in the world. Further work on new Romanian pterosaur fossils, as well as new discoveries, will show if this view is correct or not. Moreover, they'll help answer the many, many questions that remain concerning giant azhdarchid anatomy, evolution and palaeobiology. For me, among the most significant of these questions is what Hatzegopteryx signifies in the context of Late Cretaceous pterosaur disparity, ecological diversity and their eventual extinction. The latter is something we discuss briefly in our paper, as we've classically interpreted Maastrichtian pterosaurs as a biologically conservative group living on borrowed time. But our new work on Hatzegopteryx, as well as the potential recovery of a small-bodied pterosaur from Campanian sediments of Canada (Martin-Silverstone et al. 2016), and ongoing work on non-azhdarchid pterosaurs found near to the K/Pg boundary from Morocco (these being presented at SVPCA 2016 by Nick Longrich and colleagues) complicates that picture. It's looking more and more likely that our perception of the last pterosaurs as a low diversity, dying group has been distorted by sampling biases, and they may have actually been doing just fine until the end of the Mesozoic. Perhaps pterosaur extinction was a more significant event than previously realised. But these questions will have to wait. For now, it's satisfying to finally be talking about these new data on what was clearly one of the coolest animals in the pterosaur canon. I'll leave you with a thought echoed from our paper: whether the ideas discussed here are right or wrong, the fact we can discuss 'the Hatzegopteryx arch predator hypothesis' without laughing is a real sign that interpretations of azhdarchids - and pterosaurs generally - have moved on considerably. Could our colleagues of 50-60 years ago have imagined pterosaurs - considered lame, underweight, creaky-winged gliding things - would be discussed in this sort of context? I imagine not. The content featured here is sponsored by another group of short-necked tetrapods, my Patreon backers. Supporting my blog from $1 a month helps me produce researched and detailed articles with paintings to accompany them, as well as peer-reviewed papers on which to base them. In return for being a Patreon backer you get access to bonus blog content: additional commentary, in-progress sneak-previews of paintings, high-resolution artwork, and even free prints. For this post, we'll be looking the four years of development that went into the Hatzegopteryx painting shown above, revealing the earliest versions up to the final, published version. Sign up to Patreon to get access to this and the rest of my exclusive content! Buffetaut, E., Grigorescu, D., & Csiki, Z. (2002). A new giant pterosaur with a robust skull from the latest Cretaceous of Romania. Naturwissenschaften, 89(4), 180-184. Buffetaut, E., Grigorescu, D., & Csiki, Z. (2003). 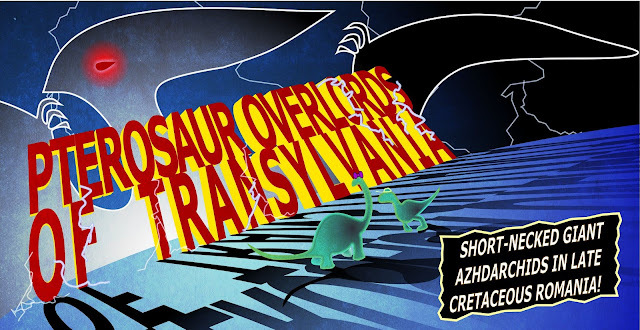 Giant azhdarchid pterosaurs from the terminal Cretaceous of Transylvania (western Romania). Geological Society, London, Special Publications, 217(1), 91-104. Martin-Silverstone, E., Witton, M. P., Arbour, V. M., & Currie, P. J. (2016). A small azhdarchoid pterosaur from the latest Cretaceous, the age of flying giants. Royal Society Open Science, 3(8), 160333. Vremir, M. (2010). New faunal elements from the Late Cretaceous (Maastrichtian) continental deposits of Sebeş area (Transylvania). Acta Musei Sabesiensis, 2, 635-684. Vremir, M., Witton, M., Naish, D., Dyke, G., Brusatte, S. L., Norell, M., & Totoianu, R. (2015). A Medium-Sized Robust-Necked Azhdarchid Pterosaur (Pterodactyloidea: Azhdarchidae) from the Maastrichtian of Pui (Ha&tcedil; eg Basin, Transylvania, Romania). American Museum Novitates, (3827), 1-16. Witton, M. P., & Naish, D. (2008). A reappraisal of azhdarchid pterosaur functional morphology and paleoecology. PLoS one, 3(5), e2271. Witton, M. P., & Naish, D. (2015). Azhdarchid pterosaurs: water-trawling pelican mimics or “terrestrial stalkers”?. Acta Palaeontologica Polonica, 60(3), 651-660. Sorry, but it's nice to finally see the paper for the new Hatzegopteryx material. It's just so exciting! Also the base of the cranium being as wide as shown here, took me by surprise. Really interesting stuff here. So, basically, it was like a pterosaur version of a phorusrhacid? Phorusrhacids had an uniquely specialized bill. I don't think it would've been too interested in the hatchlings. They were really small compared to the other stuff that it fed on. Still, hatchling sea turtles would be a good and seasonally abundant food resource for young and growing individuals. 1: Hatz wasn't huge all his life; 2: sea turtles emerge on land so terrestriality is no objection; 3: all of dinosaurs, terrestrial crocs, monitors and mammals would be faster, more formidable and more dispersed than a nestful of emerging turtle hatchlings. Agree about turtles being easier prey, although I'm not sure that justifies having a neck capable of withstanding the weight of a Sedan pressed against the bill. Also wonder whether this would lead to an evolutionary arms race, with sea turtles becoming bigger, tougher, more protective and more threatening in response to predation by large, tough Azhdarchids. I also wonder if there's any way to determine whether the beak was more ideal for penetrating thick-but-soft flesh or hard turtle shells? I.E. if these did primarily kill shelled animals, their beaks should be more adept at crunching the shells than at piercing through many inches of flesh, whereas if they were primarily eating land animals, the story is different. We might also hope that Hatz or one of the other short-necked robust Azhdarchids has footprints or fossil foot material. Other Azhdarchids were really not well equipped for walking on beaches. Compared to fish-eating pterosaurs like Pteranodon, their feet are quite small. If I remember correctly, About 30% tibial length. So if we approximate a Hatz foot as being an 40 cm by 15 cm rectangle, and it's got 4 of them, then the foot pressure under its own weight should be around 10000 N/m^2, which is half the pressure under a human foot, but remember that Azhdarchids need to take off, and taking off on sand or mud may not be ideal. 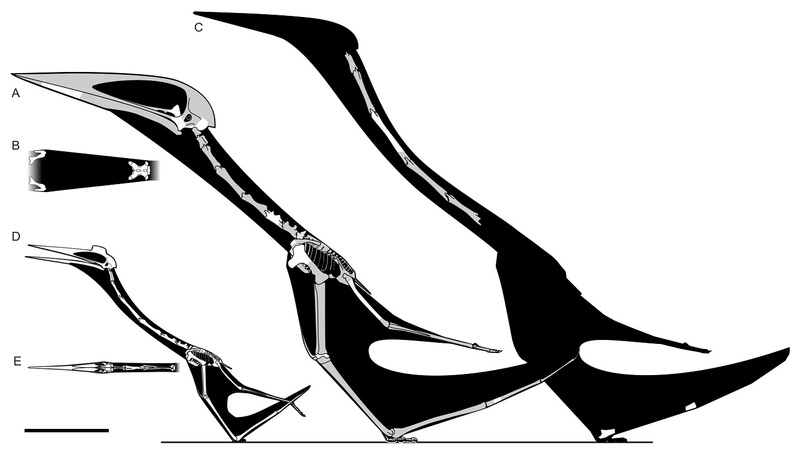 Other pterosaurs that were less strongly terrestrial seem to have about double the length of feet in proportion to tibial length. So if we find evidence of larger feet for Hatz, maybe that would be evidence that it did a lot of takeoffs from sand or mud, which would indicate that eating sea turtles is more probable. Correct on known azhdarchid foot measures, but as Mark Witton said there might be a degree of variation since azhdarchids probably were fairly ecologically diverse. True. That does make it seem more likely Hatz was eating turtles. Unfortunately, Alanqa is known from quite limited remains as well, correct? Although I don't know how frequently turtles would be around. If they're landing on the beach once a year, they're not a great food source for a large warm-blooded flying carnivore with a high metabolism, and predator saturation means the Azhdarchid cannot gather a significant fraction of them before they leave. So even if it ate turtles sometimes their seasonal availability would probably mean it still primarily hunted faster, softer game inland. In your book and a few earlier sources you've also suggested that Thalassodromeus was a "raptorial" species. Maybe this is simply an ecological niche taken by various pterosaur groups across the Mesozoic? And jeez, Hatz was a monster. I didn't imagine it would be able to use its beak as basically the pterosaur version of a bludgeon. BTW why does the Hatz skull look a lot like that of Zejiangopterus? Is it indicated by the skull bones or some other reason? As the arch predator in the Hateg Island ecosystem, why did Hatzegopteryx need to fly at all? Yes, excellent point. If pterosaurs did become flightless, they would presumably be terrestrial quadrupeds, not bipeds. (a) How far could Hatzegopteryx fly, and what impact would this have on its ecological roles? Looking at those wings - and I admit I'm no expert in aerodynamics - it seems to me that Hatzegopteryx, while perhaps less capable in terms of long distance flights than other azhdarchids, would still be rather capable. It seems to me Hatzegopteryx could readily fly to northern Africa, and probably quite a bit further. Maybe it likes Hateg island because it doesn't get chased away from prize kills, but, it doesn't seem to be limited to Hateg island. (b) Eggs. I'm sure all pterosaurs would snack on dinosaur eggs given the chance, but it seems to me Hatzegopteryx might be better equipped than most to dig into a mound of buried dinosaur eggs. (Although maybe its bill is too wide?) Either way, I'm wondering that you don't specifically mention eggs. We don't have the exact proportions of Hatzegopteryx's wings. However, the wing elements we have suggest flight capacities similar to those of other giant azhdarchids. Giant azhdarchids are speculated to have been capable of travelling across the globe with their flight abilities. Given the presence of Hatzegopteryx-like fossils in France it's perhaps safe to say that only competition from other carivores limited its range. Thanks for all the comments - there are several common themes, so I'll post thoughts in one response rather than reply separately. Specific ecology, use of head etc. : Remember that we are far - very far - from having a complete idea of Hatzegopteryx skeletal anatomy and any discussion about specifics of its diet or unique adaptations for obtaining food are speculative at this stage. What we can say is that the jaw material we have is similar to that of other azhdarchids - internally reinforced and massive of course - and thus not indicative of radically different foraging mechanics to its smaller cousins. We don't see any obvious indications of the skull being reinforced to use as a pickaxe against animal bone, for instance. We assume Hatz could do some gnarly stuff with its head against small animals and vulnerable tissues, but that's mostly on account of its giant size and indication of a stress-resistant skeleton. But who knows what the skull was actually like - it might turn out quite different to that of other azhdarchids. Flight: Again, without more material we can't say much about Hatzegopteryx flight. The wing bones we have - and remember they're only bits and pieces - show the same adaptations to flight as smaller pterosaurs and seem, so much as we can assess them, to be scaled appropriately to a giant pterosaur. So that puts a tick in the 'probably volant' column, but beyond that it's difficult to say anything without lots of arm waving and speculation. This is especially so because of a point we made in the paper, and that others have made in earlier publications: it's looking increasingly likely that azhdarchids were more disparate than we realised, and aspects like wing proportions may not be consistent across them. This is a time for azhdarchid workers to be cautious about extrapolations and speculations, because the glimpse we have of their palaeobiology shows us more about what we don't know that what we do. Thalassodromeus: Yes, in my 2013 book I suggested this species as could be a powerful terrestrial stalker. If I'm correct (and incidentally, unpublished work on its jaw muscles verifies that they are atypically big) we might see this as a trial run for what Hatz would do, at much greater size, later on. But again, Thalassodromeus is not a well known animal, and I could be wrong. Let's move on to the important question here. I weigh 150 pounds; with motivation I could get to 135. Would I be able to ride this animal, on the ground or in flight? Plainly it would be mightier in battle than Arambourgiana, and very nearly as high at the shoulder. On the ground, yes, in the air, yes, but I'm not sure if it would be able to do thermal soaring with the extra weight, so your flight range could be limited to few-kilometer mad dashes at low altitude and 100 mph. Also, you'd probably need to adjust your saddle during flight so you'd be leaned forward into a streamlined position. You might also want a streamlined helmet. How much do we know of Eurazhdarcho? Would it have played a Hatzegopteryx-like role, filling the mid-sized predator slot; or do you think it was more a supporting character, with the true mid-sized predator slot being filled by young Hatze itself? I'm not arguing regarding standard Pterosaur adaptation such as hollow bones and such; however, was there enough wing surface for a gliding, let alone powered flight? Is it not possible that these very large Pterosaurs were flightless forms?